A group of university staff, students and graduates from Dumfries have set off on a 100-mile protest march. The five-day walk is part of the campaign against Glasgow University’s move to halt undergraduate admissions at the Crichton Campus. 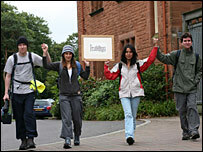 The group set off from Dumfries and hopes to reach the main university campus in Glasgow on Tuesday. The students want to impress on Principal Sir Muir Russell the need to remain on the Dumfries site. The University of Glasgow cited £800,000-a-year losses as the reason for its decision to stop admissions. It prompted widespread protest from politicians, staff and students. Crichton graduate Wendy Downes said she had organised the march in the hope of getting home the message about the unpopularity of the move. The protesters hope to present the principal with a sketch of the campus and a book of testimonials from students and staff on the importance of the Crichton. “Everyone anywhere has the right to an education,” said Ms Downes. “It’s not always easy for people to go to the city. This entry was posted in Crichton Campus, Dumfries, Glasgow. Bookmark the permalink.